When I pulled back the big bush partially covering the plaque on the side of the Ambeyrac church that honored Belgian refugees, I found this plaque above it. It commemorates a famous Corsican Resistance organizer who obviously organized in Ambeyrac as well. Most of my online research about this man centers around his work done on Corsica. He was, in fact, killed there by Blackshirts in late 1943 during the Liberation of Corsica. But before that he organized a Resistance cell in the Aveyron. 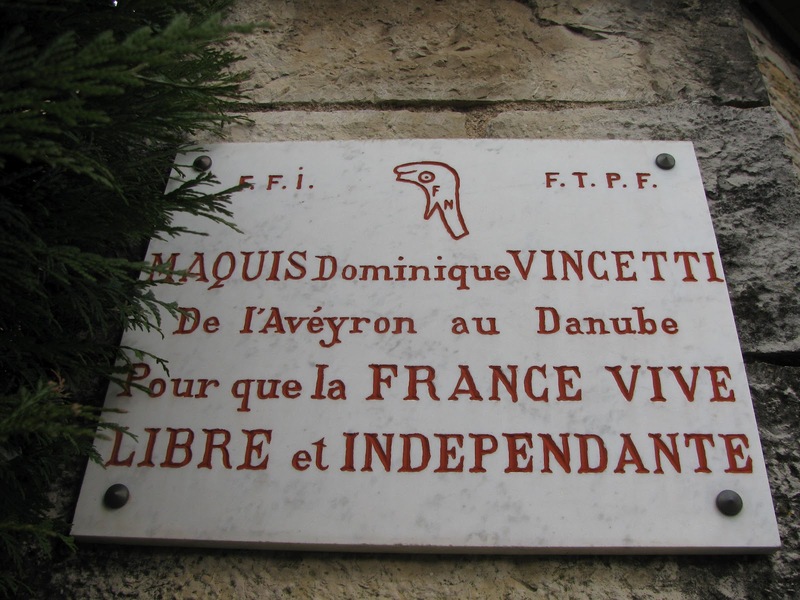 Instead of trying to tell you the story myself, I'll simply use his words as recorded in a history of the Resistance in the Aveyron written by history professors, Christian Font and Henri Moizet. Dominique Vincetti - The establishment of the Ols maquis in Aveyron. I found this information at a very informative website: STRUTHOF, the former Nazi concentration camp in the Alsace. Photos courtesy of Google images. I'm fascinated by these stories. Even so long afterwards, there are people around here who remember. These things go deep.